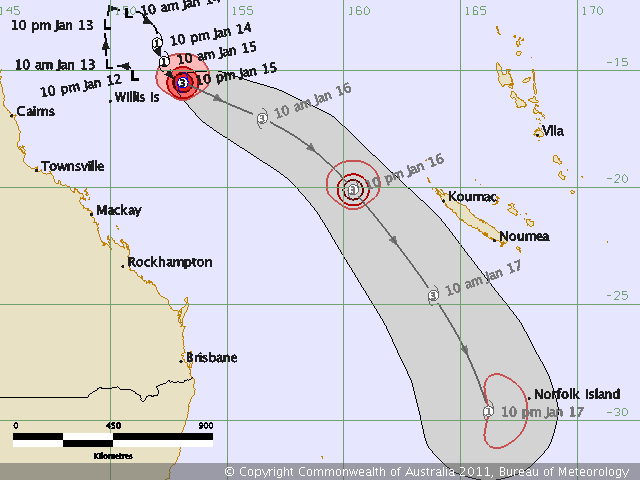 A major preoccupation in FNQ at this time of year is watching the predicted and actual tracks of cyclone. This being a La Niña year, and a biggie as they go, we’ve been watching developments with interest. 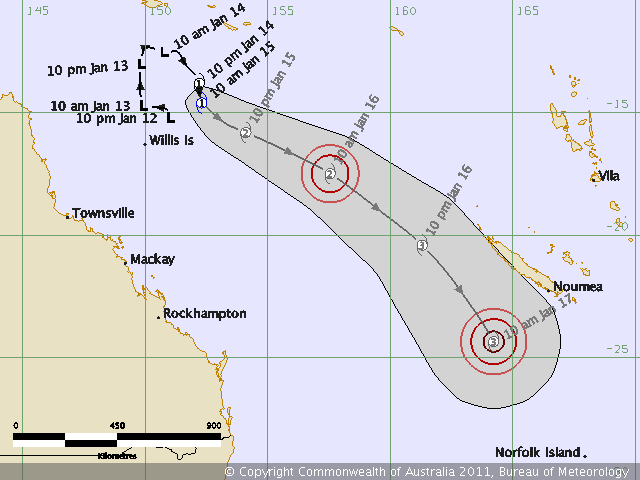 The best way to deal with cyclones is to be prepared and the information from the Bureau of Meteorology is invaluable. 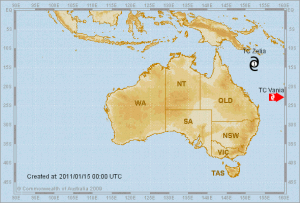 As usual, clicking an image will give you a full-sized version. 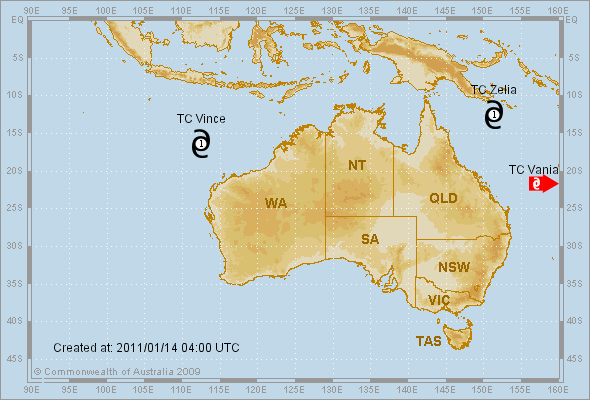 TC Vince, off the coast of Western Australia, has petered out so the people in that region can relax again. 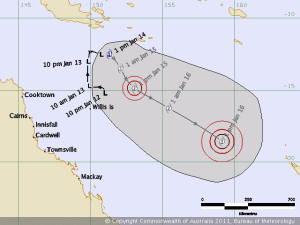 As you can see, for the first couple of days of its life it was a Tropical Low but on the 14th it was predicted to become a Category 1 Tropical Cyclone. Cat 1 is the lowest strength on a scale of 1-5. 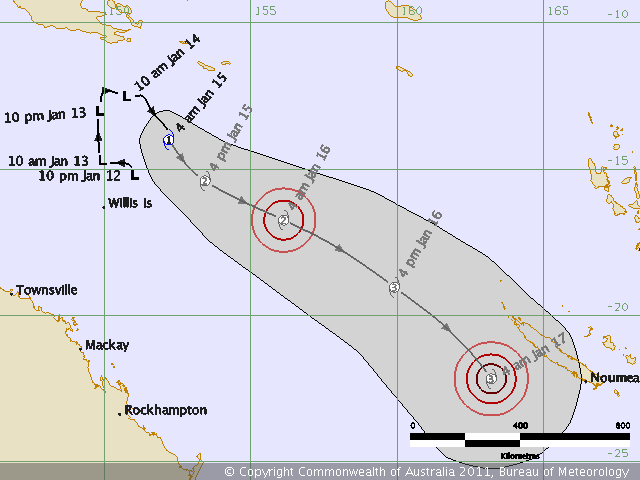 The prediction was changed indicating that the Tropical Low would become a Cat 1 cyclone early on the 15th as the people at the Bureau of Meteorology were able to get a better idea of where it was going and how it would develop. 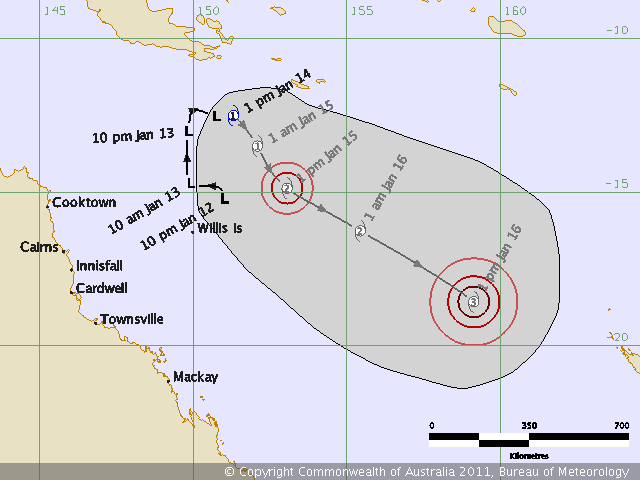 It turned out that the first prediction of the 14th was correct and the cyclone was duly named TC Zelia. 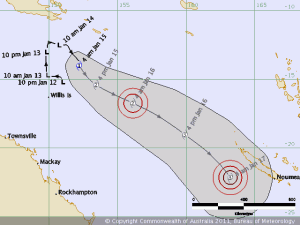 There is an alphabetical list of 104 names that BoM uses for cyclones and Zelia will be the last of the current A-Z list. The next one will be TC Anthony. 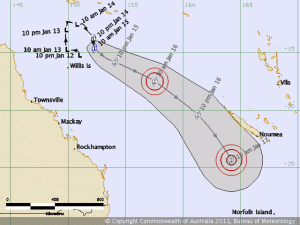 By the evening of the 15th Zelia was still a Cat 1 cyclone but was still heading in a general south east direction. 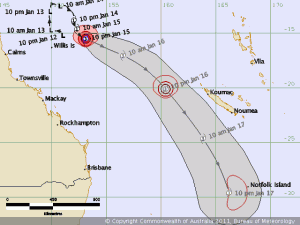 By late on the 15th Zelia was still heading SE but had grown in intensity to a Cat 3. 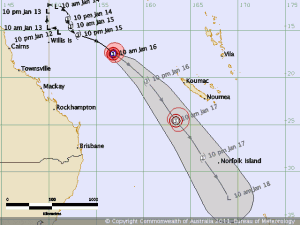 As you can see from the image above, Zelia was due east of us, still a Cat 3 and is still heading SE but moving at a faster pace. 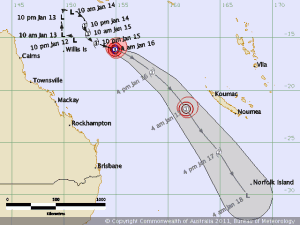 It was predicted to pass west of the coast of French Caledonia at 3am this morning but the latest information from BoM hasn’t been published yet. 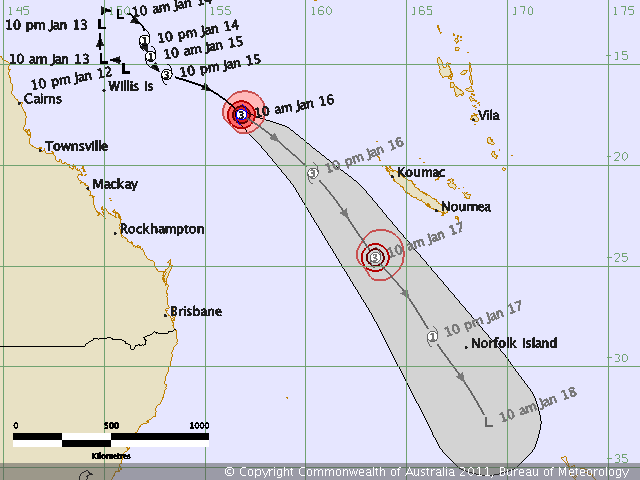 The people of French Caledonia and Norfolk island should escape the worst of the winds but will doubtless get a good soaking. 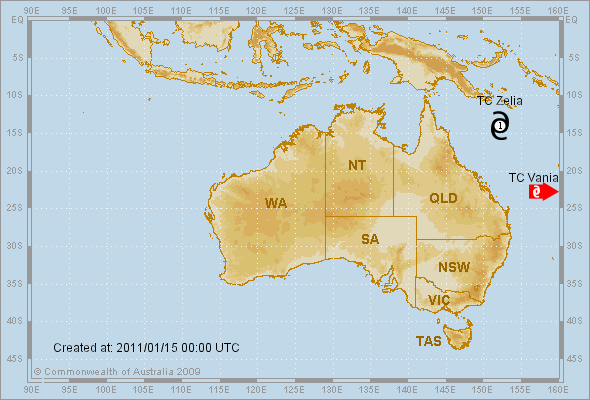 I’ll update this post as fresh maps become available and many thanks to the Australian Bureau of Meteorology for the data. 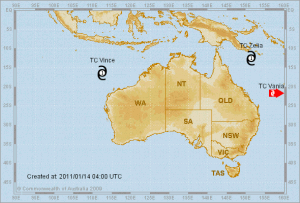 NB The various cyclone categories used in Australia can be compared to other basins here. 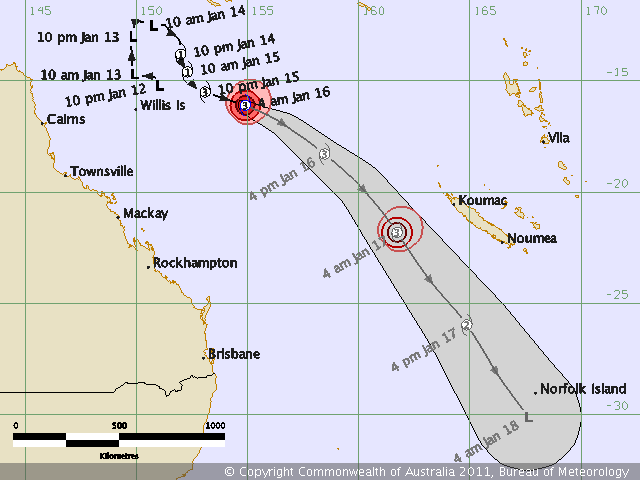 This entry was posted in Weather and tagged cyclone tasha, cyclone zelia, cyclones, Weather on 2011-01-17 by pete.